Without a doubt, my FAVORITE unit in Geometry is Right Triangles & Trigonometry! (My least favorite is Logic & Proof but that’s a complete other conversation.) Trigonometry is new to the students and the applications are so much fun. 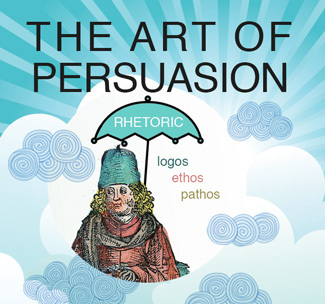 I wanted to share five of my favorite resources for this unit that have found great success with. 1. 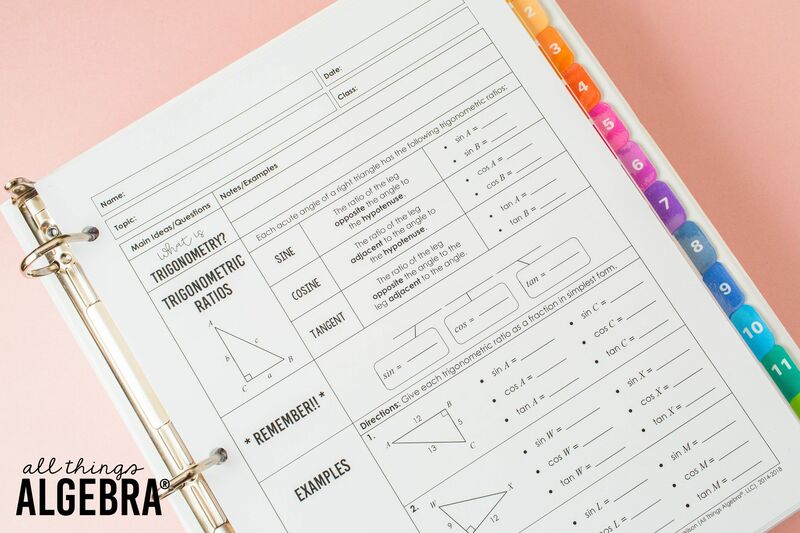 Right Triangles & Trigonometry: We need a way to introduce the topics in a clear and organized way and this unit does just that. 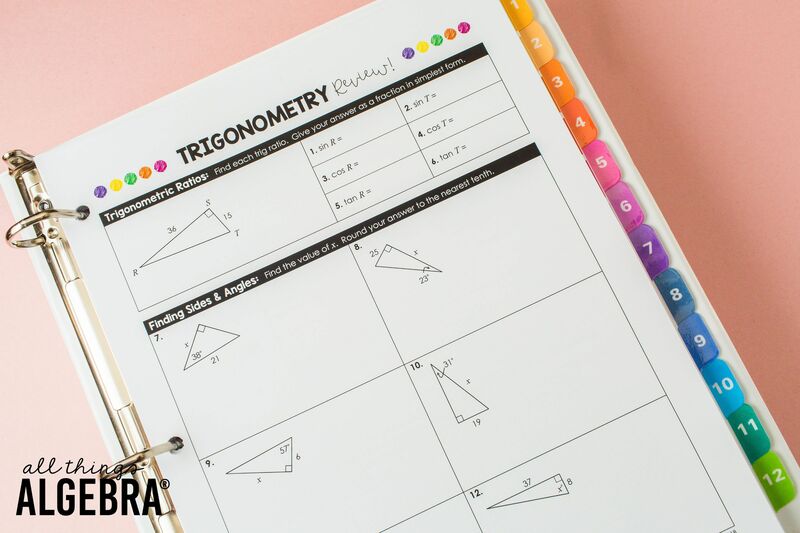 It provides all the basic instructional materials (notes, homework, and assessments) to introduce right triangle trigonometry to students. It is one of my most popular Geometry units! 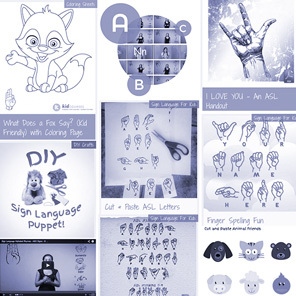 Students follow along with the simple layout and there are lots of examples provided for students to practice. 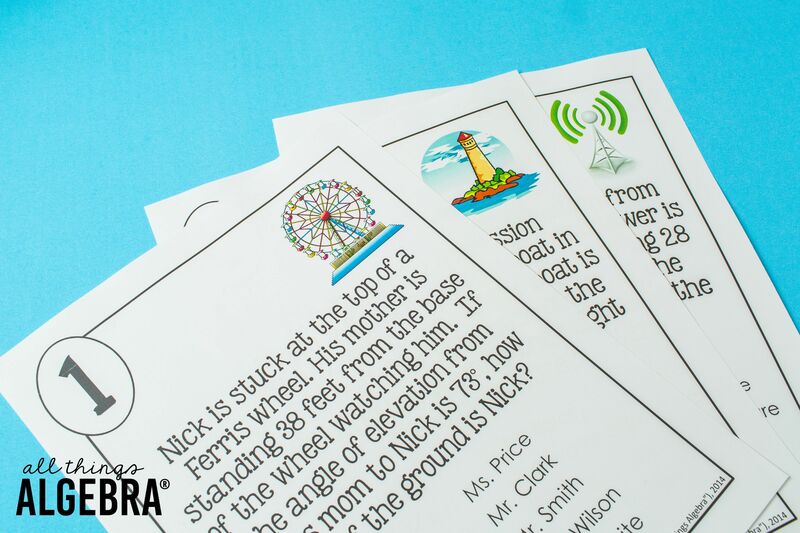 I prefer to have a consistent format with my students when I introduce materials and they seem to respond well the way the materials are set up. There is also a sample pacing guide for you to follow along and makes planning so easy. 2. 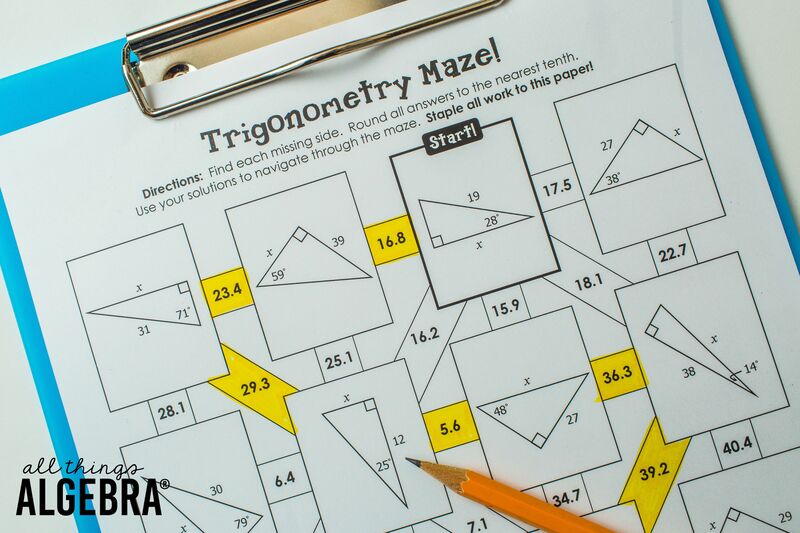 Trigonometry Mazes: Students LOVE mazes and they are such great practice and don’t come across as a “worksheet”. They use their solutions to navigate through the maze. This particular set includes multiple mazes for students to practice finding both angle measures and side lengths. 3. Angle of Elevation and Depression Math Lib: I love angle of elevation and depression applications! 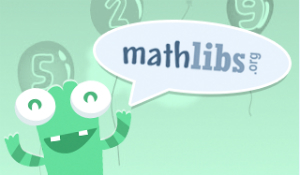 Students adore Math Libs because they create a fun story about teachers in their school. Each problem reveals a piece to the story. They are my go-to activity, especially when doing word problems. 4. 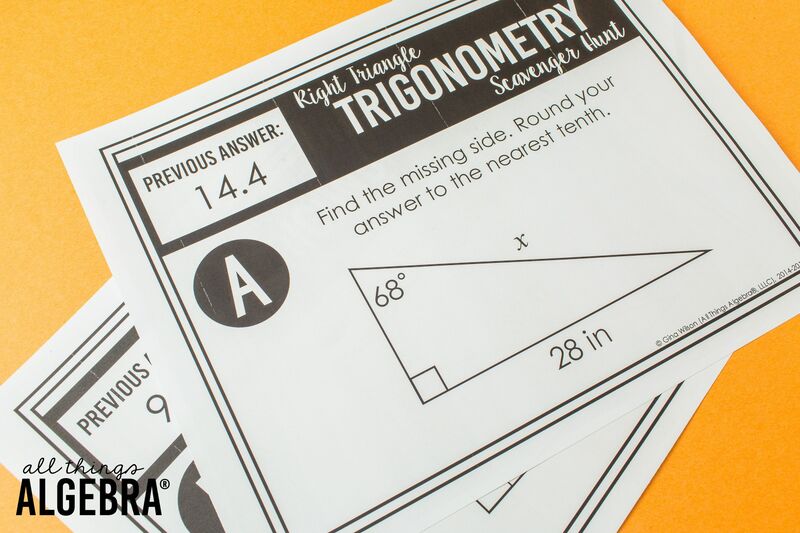 Right Triangles & Trigonometry Scavenger Hunt: Just like Math Libs, students love scavenger hunts too. It’s amazing how just getting students out of their seats and handing them clipboards changes everything. They are so engaged, especially when they have a way of checking their answers. 5. 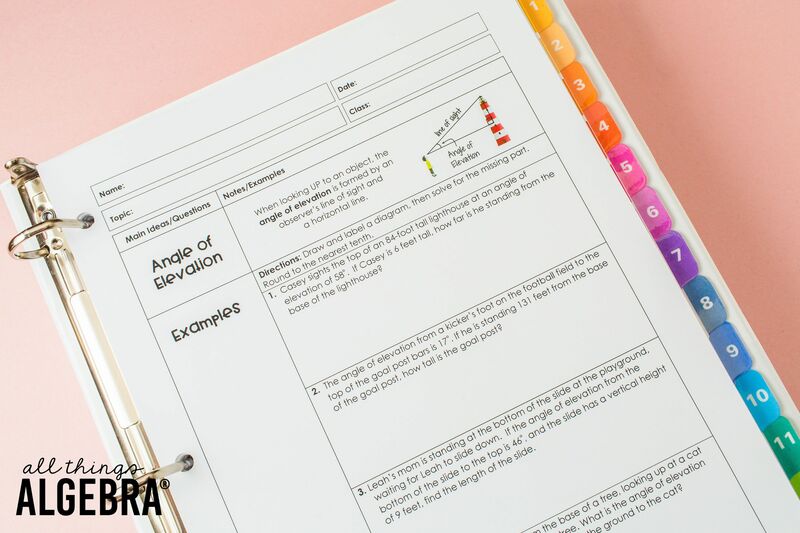 Trigonometry Gone Fishin’ Game – Have you ever had a resource completely change your classroom? I’ve had a few and the Gone Fishin’ games are definitely one of them. The only way to describe this game are with the words “completely engaged”. Students absolutely LOVE IT. They can throw a Koosh ball at the board and “catch a fish”. Here is a video preview of the game. The fish really do swim and students adore it! I have so many other activities for this unit, but I wanted to narrow it down to my favorites. I hope you find something new to try that you LOVE!